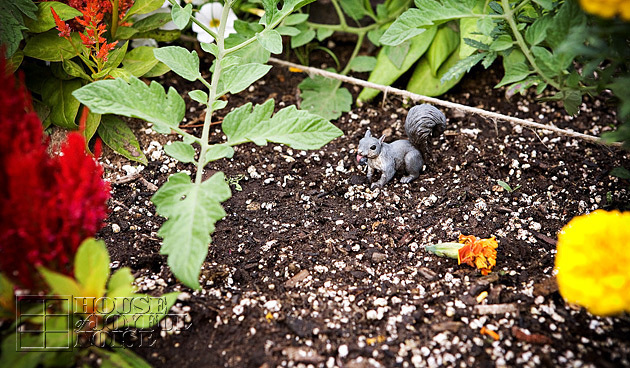 Now let’s look at their gardens, today…. 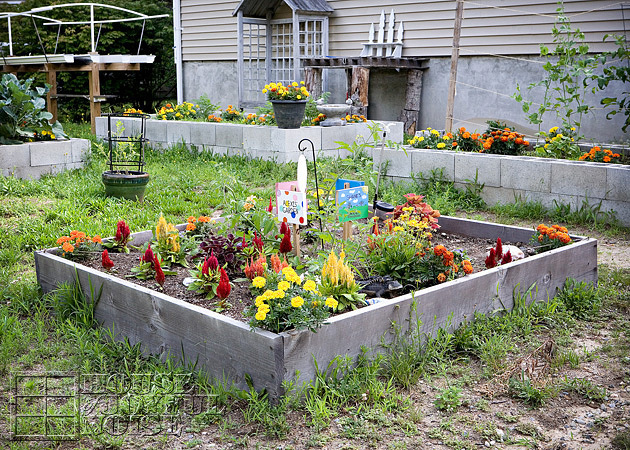 As you can see, it’s a small garden bed, measuring only about 6×6′. And then, it’s divided into quarters, for their own sections. In years past, the square was divided with string, into 4 smaller squares, so they each had a corner quarter of the bed. This year however, Michael decided to make it different, divided it with string like a big X, corner to corner. So each of their gardening areas are triangular this year. 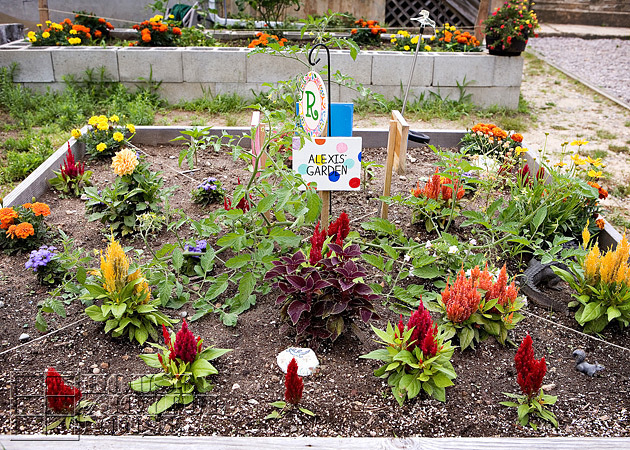 As I show you each kids’ triangle space of garden, I will start with their garden sign each of them painted. They made new ones this year, as the ones they made for the previous two years had gotten too weathered. You may notice the string that divided their gardens in some photos, and no doubt, you will notice also that some of the kids are more into their gardens, than others. But that is alright with me. As long as they are responsible and remain committed to caring for the plants or flowers they did decide to put in their garden. 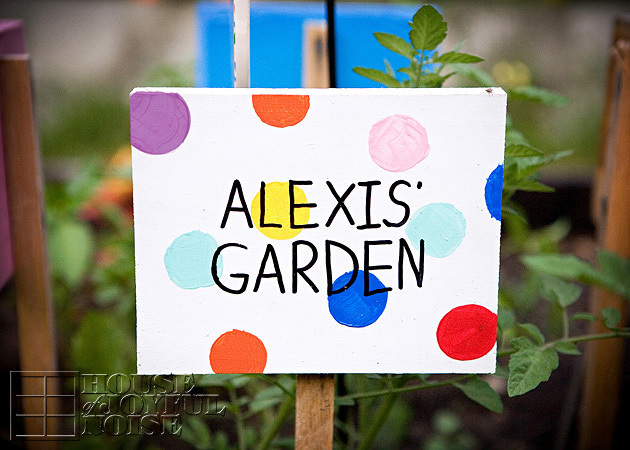 Alexis went with a simple polka dot sign this year, and I love it! It’s fun, colorful and quirky, just like her. Last year her sign had a painted lady bug, bumble bees, and dragon fly, on a white background. Her also. She loves bugs and little creatures; with exception of bees or any other flying stinging insects. In fact she is borderline terrified of those. But she’d hold a snake in a heartbeat. 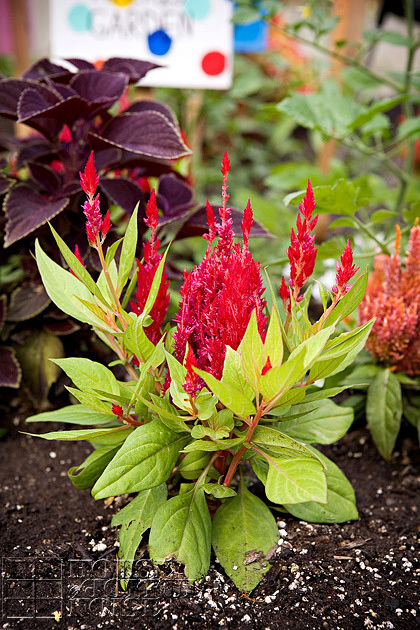 Every year, Alexis chooses to plant lots of Celosia in her garden. Although she calls them ‘Truffula Trees’, in reference to The Lorax, by Dr. Suess. 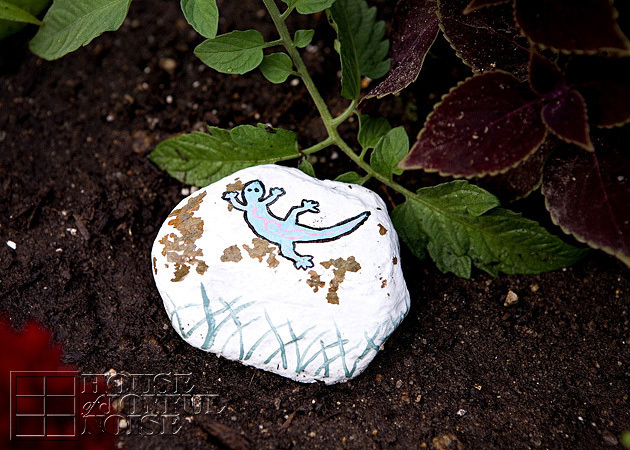 She painted this garden rock last year on a creative day, of a Gecko. Yup, she loves those, too. This summer she’s been working at a kids camp as a counselor, and in between working with the kids, she spends much of her time catching little frogs. Just for fun. She’s that kind of girl. JackMichael has a great sign this year, as well. It was a challenge fitting his whole first name on there! So he needed a little help with that part. He stamped the fish on. Last year his sign was the same blue background, with little, happy, orange goldfish painted all over it. He kept it pretty simple this year, too. 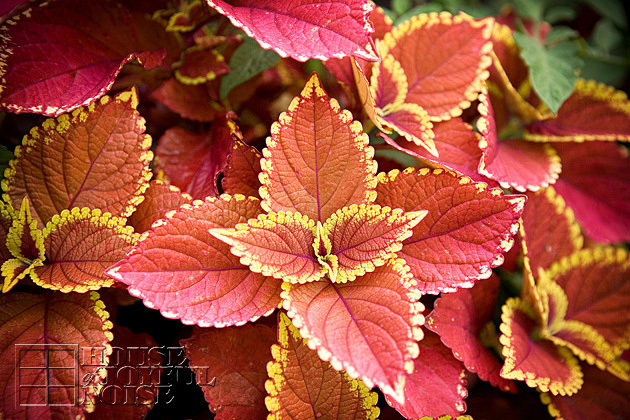 The Coleus Defiance plant is the main attraction, although he also chose to grow several hot pepper plants. Looks like the center tomato plant spread his way, as well. 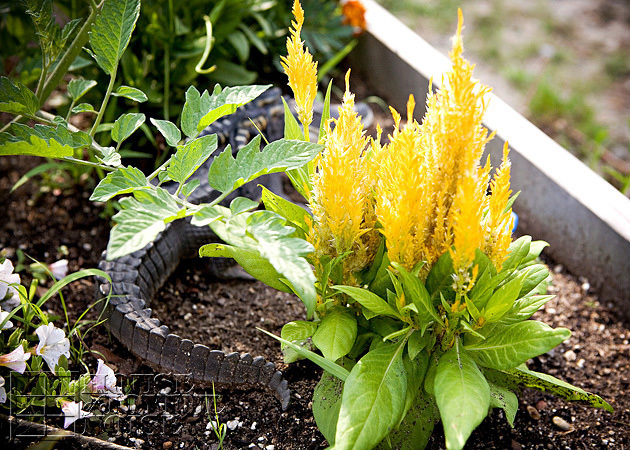 In the corners he shares some marigold plants with his neighbor gardeners. 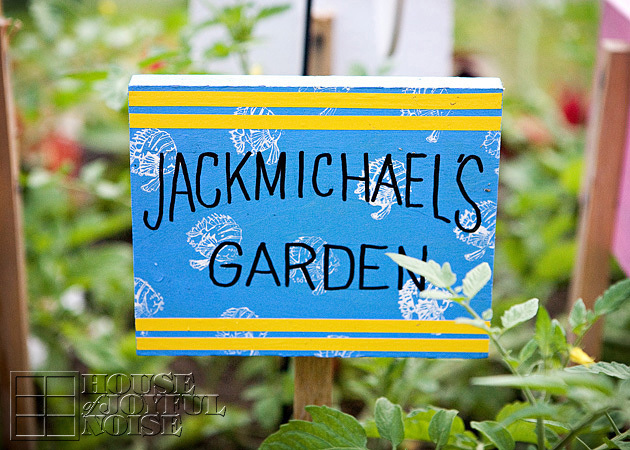 In a previous year JackMichael’s garden had a sea theme, and along with his goldfish (well, not really sea, I guess) sign, he put a large message-in-the-bottle in his garden, which I thought was super cool and creative. Wish I took a photo of that. Olivia has several things growing in her garden. 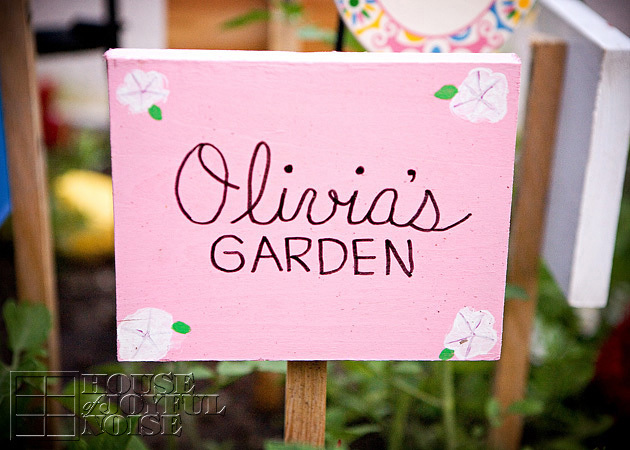 Olivia enjoys gardening, and pretty much all things domestic. So she is a great help in any of the gardens. Shane is a detail kind of kid, and made a little landscape on his sign. It seems he’s got a little of what everyone else has growing in his gardens! 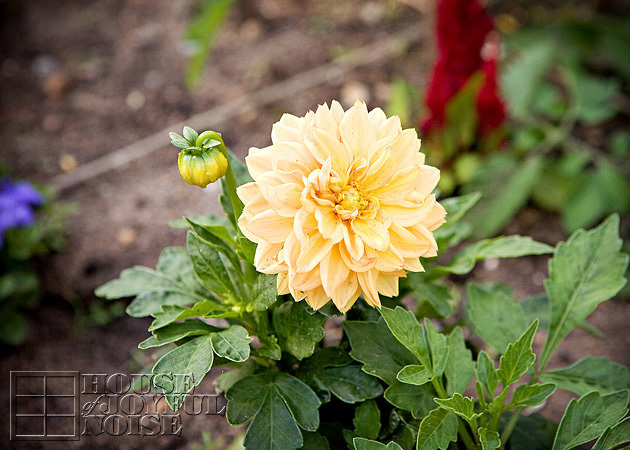 Plus different variety of Marigolds, as well as two other white and white-pink flowering plants that he actually dug up from the wild and replanted in his garden. I forgot to check what they even are, but one looks like a daisy variety, and the other some tiny bell flowers. 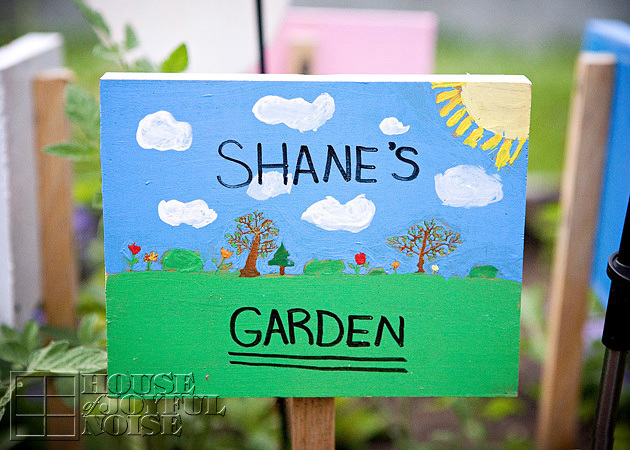 The details of Shane’s garden are always fun…. He repainted his rocks (since taking the photo of the garden as a whole, before this one), on a creative day this past spring, but repainted them exactly as they were before. I just think they are the sweetest thing ever! 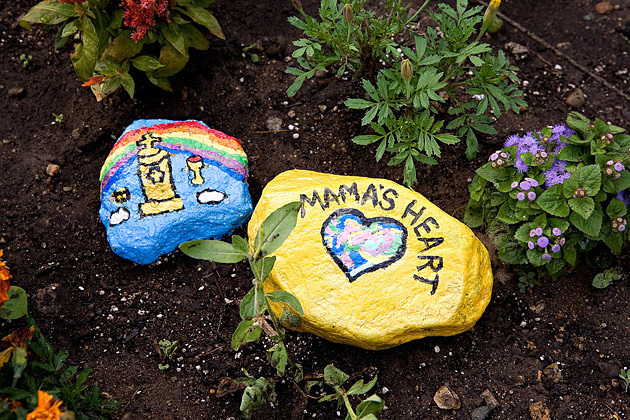 The many colors in ‘Mama’s Heart’ is symbolic of all of the love and joy he knows is always in my heart, for my children. The other is a Holy Communion themed: a Tabernacle, with the Body and Blood of Christ on each side. 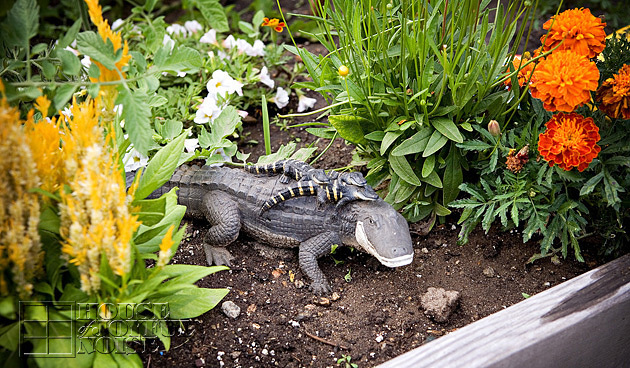 He also bought this big Mama gator, with babies on her back, for his garden. I love to find the little surprises, that they have added to their gardens. I truly enjoy gardening, although this year I have not been able to do as much myself as I normally have, due to my broken ankle in early spring: prime garden prepping time! I had even gone above and beyond with a strong start to my gardening plans, starting many of the plants from seed indoors, growing under lights. (Remember? ; if you follow us on Facebook.) But then, the ankle accident happened, I was thankful just to get my family to get them all planted outdoors in their garden beds. From there, the gardens have not gotten AS MUCH of the amount of love and attention they have in previous seasons. I just feel bad asking everyone else to go weed or water, and bad because I really wanted to do it myself. I’m quite better and able now, but the gardens are also quite out of hand by now, rampant with weeds, etc. Still producing but….clearly not being tended to with time, love and attention. But for many years now, I have gotten so much joy and other rewards, from my time spent in the gardens. 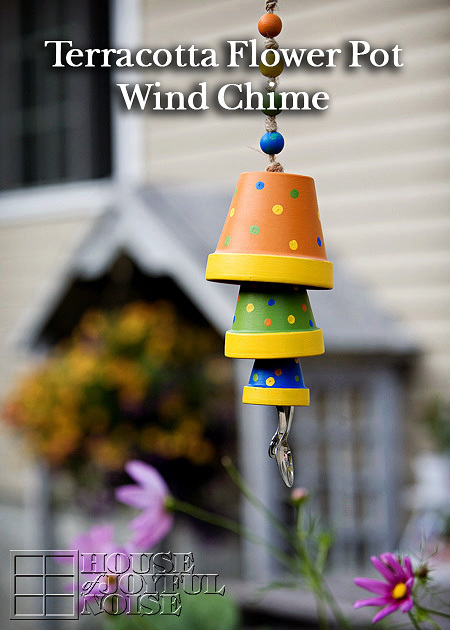 I truly feel that gardening holds so many valuable lessons for children too! 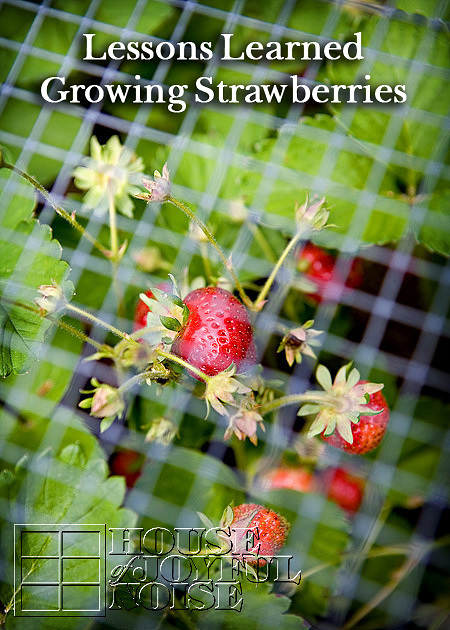 ….giving many, many fruits beyond what it physically produces. 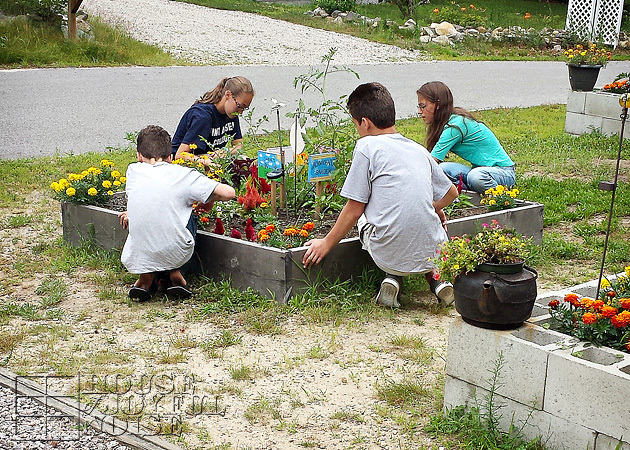 I could think of my children’s gardening as homeschooling, and in part, I do. Because it certainly is home economics, agriculture, science and science experiments, nature studying, etc. But regardless, I think it’s important life skills. 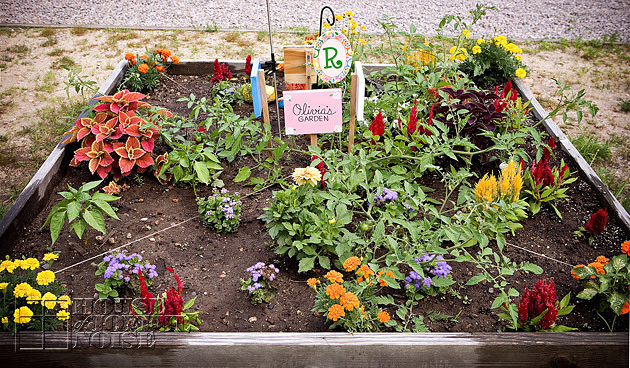 Knowing how to grow your own food, and perhaps herbs and flowers, too. 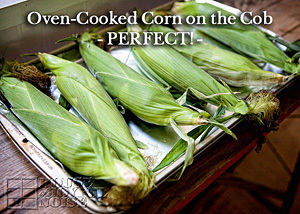 It’s at the least, a necessary part of true homesteading. But beginning some gardening when children are young, also teaches them other important lessons, such as responsibility, seeing the fruit of their hard labors (quite literally, where gardening goes!) and the sheer value and beauty in nurturing LIFE. 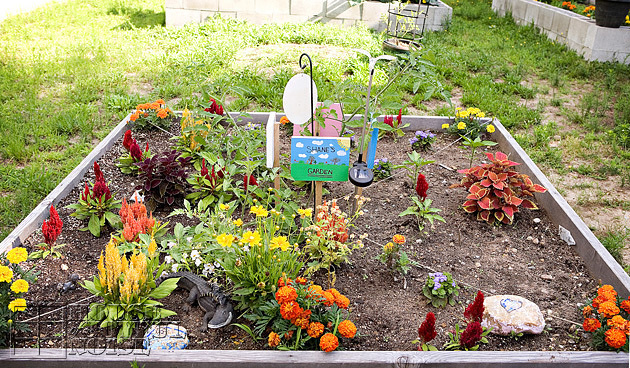 Gardening helps us all see the beauty and provisions in the details of God’s Creation, that He blessed us all with. More than anything, and because of all of those things, I hope what they really learn, is to love gardening, too. When I was a little girl, I enjoyed gardening with my mother, and playing in the dirt in general. In fact, I have a little surprise-photo for you today! This is an old newspaper clipping of me (1974) when I was 5 years old, that my mother kept, then passed on to me, and I have had it in safe-keeping, for years now. We had grown some great big tomatoes in our garden, but the two-pounder put us in the local paper! I am thrilled to still have this, if only for how much my children love to see it! They think I couldn’t be any cuter, of course. I hope to keep track of it in a safe place, for the generations to come. In my adolescent years, and even through the first many years of marriage, I had lost my love for gardening. I had no interest in it at all, and couldn’t understand anyone who did. I felt it took so much time, effort and….patience. But thankfully, I got back to my roots, and came back to really enjoying the process and rewards of growing things again, and putting food on the table. So I am happy that my kids have their hands in the dirt at a young age, just as I did when I was little, with my mother. I am confident at least some of them will one day be digging up their own yards, planting and picking, and maybe even calling Mama up for some of her gardening advice. 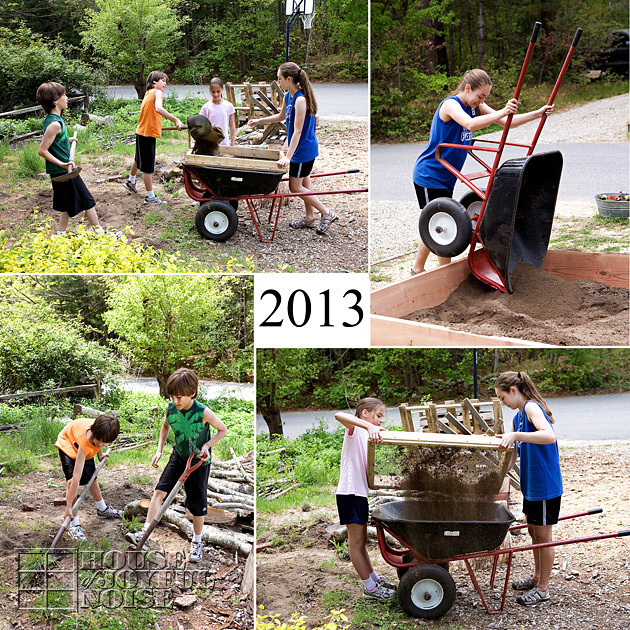 And I believe all of them will treasure these memories of gardening together, with their siblings and me, as kids. And if it sticks….encourage their own children, to get their little hands dirty in the gardens, too. But I don’t want to think too much about someday. For now, I am going to be present, knee-deep in the here and now, planting seeds in hearts and soil, and with God’s grace, watching all of the beautiful details that grow from it. 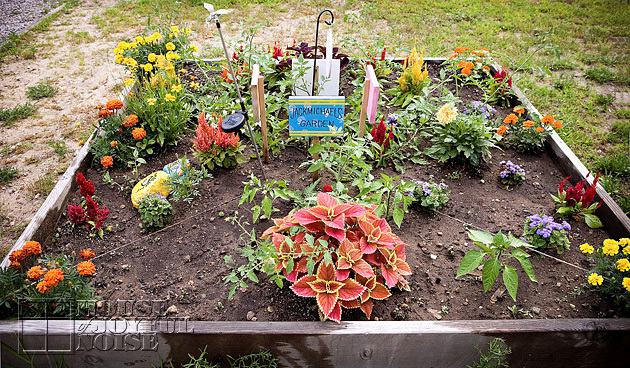 What a perfect way to teach them about gardening!! I love how their personalities come out in their gardens and the secrets they hide in them! 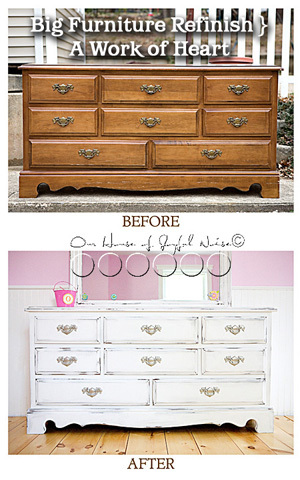 I would love to do this with my grands…they need to move closer to me!! Great photos. The signs surely reflect each kids personality. Looks fun! Great job Richards! Glad you enjoyed the kids gardens, Kimberly!